Yerevan (Armenian: Երեւան) is the capital of the Republic of Armenia, one of the three hubs of the South Caucasus and is home to over a million people - the largest Armenian community in the world. In Soviet years Yerevan underwent massive reconstruction, following architect Alexander Tamanyan's plan to make a "perfect city" - a Neo-Classical town with wide avenues, resembling Paris, Vienna and Saint Petersburg. Central Yerevan is a true jewel of early Soviet architecture. It is also home to some large scale Modern and Post-Modern marvels which are mostly the result of Soviet-Armenian architectural megalomania. In Soviet days Yerevan had already become known as the Pink City as much due to the colour of the tufa stone used for building as for the flamboyant spirit of her young population. Kentron, Centre City, City Centre or Downtown - is central Yerevan, locally known as Kentron or just Kaghak (meaning 'the city'). This is the heart of Yerevan and indeed Armenia. Though Kentron's architecture is diverse, ranging from Belle Epoque to Soviet Panel blocks, the great majority of the centre is in Beaux-Arts tradition. The city centre follows Tamanyan's plan for a circular city with two hubs - grand Republic Square, and the more elegant and soft Opera district (Opera house, Freedom Square and the Swan Lake Park). The two are linked with newly constructed pedestrian-only Northern Avenue. Kentron is also home to the University City, where the campuses of State University, Medical University, Engineering University, Agricultural University, Economics University, Pedagogical and some other universities come together in one big group. Virtually all of the museums, hotels and popular places to eat and drink are in Kentron, so most visitors will probably not venture much past it. Monument - At the top of the Cascade steps rests the towering monument to Soviet victory in WWII. Directly adjacent is the Cafesjian Museum, which houses a large collection of contemporary art, including perhaps the best glass art collection in the world. Beyond the monument is Victory Park, and the neighborhood around it is known as Monument as well. Erebuni - In this district are ruins of fortress of Erebuni, founded in 782 BC by King Argishti. Nor Nork district is the last Soviet project of residential expansion of Yerevan. It consists entirely of standardised Soviet Panel blocs. However, every tourist crosses this district on the way to 'obligatory' Garni temple and Geghard monastery (as the highway to that direction is connected to the main avenue of this district). The main attraction of this district would be the statue of Gay (or Hayk) Nahapet, the legendary founder of the nation; he's depicted as a muscular half-naked man with a drawn bow, but the name has nothing to do with homosexuality (to avoid this interesting misunderstanding most often the name of the avenue and statue is Romanised as Guy). A statue of a woman in a traditional attire in central Yerevan. Even though the history of Yerevan dates back to the Erebuni fortress, making it at least 2800 years old, little remains of what was small settlement saving the excavations at Hrazdan river gorge, Erebuni, Karmir Berd and Avan. These sites have been excavated, and the artifacts found are in museums today. Being on a strategically important place Yerevan was a constant war stage for rival Ottoman, Persian and Russian Empires. It has been repeatedly ruined by those wars or natural disasters (e.g. an earthquake in 17th century almost entirely destroyed the town). Few buildings of the old Erivan survived to the present-day Yerevan. At the time of Armenia's independence in 1918, when Yerevan was made the capital of an independent Armenia, Yerevan was a town of just 20,000. Large scale construction began, which took a more holistic approach under the new city plan laid out by Alexander Tamanyan. The plan involved the demolition of much of what existed, in favor of concentric circles, parks, and taller structures. He planned for Yerevan to become a metropolis of 200,000 people. Michael Arlen, Passage to Ararat, an autobiographical account of an American-Armenian's first visit to Soviet Armenia. Yerevan is a very ethnically homogeneous city, though tiny Yezidi and Molokan (Russian) minorities exist. Because the population of the city was only 20,000 a century ago, the vast majority of the Armenians are immigrants themselves, from all over the world. From the villages and towns of Armenia, from Tbilisi which was the centre of Eastern Armenian culture before 1918, from Western Armenia as genocide survivors poured in, and even from the middle east and Europe in a large, post-World War II wave of immigration. Since independence, the city has become the heart of the entire Armenian world, as the divisive communist governments demise has allowed the Diaspora – larger in number than the population of Armenia itself, to embrace the city as its own. 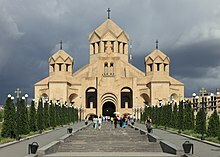 The One Holy Catholic Apostolic Orthodox Armenian Church, or just Apostolic Church, is the National Church of Armenia. It is very traditional; in practices (but not history) is similar to Orthodox and Catholic movements, and to the Reformed Churches, e.g. the Church of England. At the same time the Armenian Apostolic Church has some strikingly different practices, like allowing animal sacrifices or celebrating Christmas on January 6 along with Theophany. The great majority of Armenians identify themselves as Apostolic Christians and have their own Catholicos (religious leader, like the Pope for Catholics). Today, the vast majority of Armenians do not attend church each Sunday, with visits revolving around weddings and baptisms, or occasionally dropping in to light a candle. Soviet restructuring of the city left Yerevan with very few churches: some new ones are being built, and old ones rehabilitated. The Protestant (Evangelical) Armenians are rather few in number and have only one church on Nar-Dos street. Anglican (Episcopal) Christians congregate at (Armenian Apostolic) Surb Zoravor church for Sunday Eucharist. Orthodox Christians maintain one church in Kanaker district of Yerevan. A new, large-scale, onion-domed Orthodox Cathedral of the Holy Cross is under construction at Yerevan Lake district, visible from the highway coming from the airport. However, this will have mostly symbolic structure as the Orthodox Christians are very few in number. Assyrians do not have a church in Yerevan, but rather in the villages around Yerevan. Muslims are steadily growing in numbers since the collapse of the Soviet Union, fueled by Iranian immigration. There is one mosque on Mashtots Ave.
With a semi-arid climate, Yerevan experiences long hot summers, and cold snowy winters, both with little precipitation. The winter is not a good time to visit Yerevan, due to icy sidewalks and smoky restaurants, any other time of year is worth a visit. Spring offers mild but sometimes wet weather, and lots of green hills and wildflowers. Summer is very hot, but the long, late nights at the cafes, and the fruits and vegetables are amazing. Autumn is the most popular, with perfect weather, and great farm fresh foods. There is one tourist information office in Yerevan. It is opposite the Marriott Hotel at Republic Square. 40.14722244.3958331 Zvartnots International Airport (EVN IATA, Զվարթնոց Միջազգային Օդակայան) (14 km west of the city centre), ☎ +374 10 493000. This is the main gateway to Armenia, with direct flights to Athens, Beirut, Berlin, Dubai, Istanbul, Kiev, Minsk, Moscow, Paris, Prague, Qatar, Riga, St Petersburg, Tbilisi, Tehran, Tel Aviv, Vienna and Warsaw. No domestic flights, as the country is too small. Mini-bus 18 runs to the airport from Yeritasardakan bus stop, in front of SAS Supermarket. The cost is 200-250 dram. A taxi from the airport to city centre costs 5000 dram. The official provider is "Airport Services", Tel +374 98 828200, +374 10 595900, +374 60 430000, and they have a booking desk in Arrivals. Yandex Taxi (Smartphone App) offers competitive and honest prices, from about 1400 dram airport to city (Oct 2017). Uber and Bolt (formerly Taxify) are not available in Yerevan. Or try your luck with the taxis outside Arrivals, but insist on using the meter (sheochik) and don't settle for a flat fee. Erebuni Airport 7 km south of the city is mostly military, with no scheduled flights. An overnight train runs between Tbilisi and Yerevan, taking 11-12 hours. From Oct to mid-June this departs from Tbilisi (as Train 371) at 20:20 on odd dates of the month, reaching the border at 22:00 and Yerevan 06:55 next morning. It departs from Yerevan (as Train 372) at 21:30 on even dates, reaching the border at 04:20 and Tbilisi at 07:50. The 31st / 1st of the month may be skipped to maintain the alternation. Border procedures either side take 90 mins; if you're eligible for visa-on-arrival you can buy one here for $US6. In summer these trains may be booked out for days ahead, so buy your ticket as soon as possible - you can do so online. The coaches are standard ex-Soviet behemoths, but with fairly comfortable sleeping compartments. No catering, so bring your own food, water, vodka etc. The one way fare is about 50 lari for a second-class bunk and 100 lari for first. From mid-June through Sept this train runs daily from Batumi on the Black Sea coast. As Train 201, it departs Batumi 15:35 and Tbilisi 22:15, reaching Yerevan at 07:25. As Train 202, it departs Yerevan 15:30 and Tbilisi 00:45, reaching Batumi at 07:10. Other trains link Tbilisi and Batumi. Batumi is close to the Sarpi / Hopa border crossing between Georgia and Turkey, the main overland route into this region until passenger trains start running along the new Ankara - Kars - Tbilisi railway. Yerevan is the hub of Armenia's small rail system, with services once a day to Armavir (1 hour), Ararat (70 mins) and Gyumri (3 hours, plus a faster train F-Su). These, plus the Tbilisi train, also serve intermediate stations such as Echmiadzin and Vanadzor, but are seldom a good way of getting there. Passenger trains to Sevan and Dilijan have been axed. See the online timetable - timetables at stations are only in Armenian script. You can also cross between Georgia and Armenia at Gogavan / Guguti and Bavra / Ninotsminda: these routes are trouble-free. The other approach is from Iran, crossing at Nordooz / Agarak. From there it's a six hour drive to Yerevan: interesting places along the way are Meghri, Kapan, Goris, and Sisian. Do not even think of trying to cross into Armenia by road direct from Turkey or from Azerbaijan. Minibuses (marshrutkas) are the chief mode of transport within Armenia and internationally. Some five or six minibuses run daily between Tbilisi and Yerevan, taking 5-6 hours (via Vanadzor & Debed Canyon) and costing 6500 dram or 35 lari. They depart in the morning to a very approximate timetable, setting off when full or when the driver so pleases, with the last departure around 1 pm. Change in Tbilisi for destinations across Georgia, Turkey and (if you're sure of your welcome) Azerbaijan - these no longer have any direct services to Yerevan. Buses no longer run across the border with Iran. From Tehran or Tabriz, take local transport to Nordooz, walk across the border to Agarak, then you should be able to find a minibus to Yerevan. Tour bus Yerevan-Tbilisi: Envoy Tours (based at Envoy Hostel on Parpetsi Street) run tours around the country, which include a one-way tour from Yerevan to Tbilisi (Friday) and Tbilisi to Yerevan (Saturday). The tour takes 11 hours via sites along the Debed Canyon, and costs 30,000 dram (credit cards accepted). They also run 2 / 3 day tours to Nagorny-Karabakh. The centre of Yerevan is compact and easy to get around by foot. Watch your step, however, as construction sites, potholes and aggressive drivers abound. Be careful especially while crossing the street. In Yerevan, Armenia (and many other places) the drivers may tend to be very distracted when driving and don't pay attention to the road, especially to jaywalkers. There are penalties for jaywalking and crossing the streets in non-designated areas, and once spotted by police, you will have to pay a fine of 3,000 dram. The metro system in Yerevan is quite reliable and modern, having been built in the early 1980s. It is the quickest way around town, and at 100 dram, the cheapest aside from walking. Tickets are not issued, you buy plastic tokens and use these to operate the entry turnstiles. But it's underused, as most citizens find minibuses more convenient. The metro is a single J-shaped line covering 12 km. Trains run every five minutes from 06:30 until 23:00: platform indicators count up, from 00:00 when the previous train departed. Due to Yerevan's uneven landscape, the stations are mostly very deep, but sometimes the line runs overground. As with other ex-Soviet metro systems, stations are elaborately decorated, blending Armenian national motifs with late-Soviet architecture. Photography is not allowed. Plans to build two further lines (forming a triangle, like Budapest) have so far come to nothing. 40.19788944.4942331 Barekamutyun (Baregamutyun, ie "Friendship", Russian: Дружба), Marshal Baghramyan Ave (for National Archive of Armenia, Yerevan Expo). 40.19169444.5059442 Marshal Baghramyan (Marchal Baghramian), Marshal Baghramyan Ave (for American University of Armenia, Embassy of UK, Lovers Park, National Assembly of Armenia, Presidential Palace). 40.18694444.5211113 Yeritasardakan (Eritasardakan), Isahakyan St (for Abovian street, Alexander Spendiarian Armenian Opera and Ballet National Academic Theatre, Freedom Square (Azatutyan Hraparak), Komitas Chamber Music Hall, University of Architecture and Construction, Medical University). 40.17851544.5156284 Hanrapetutian Hraparak (Republic Square, formerly Lenin Square), Republic Square (for Armenia Marriott hotel, Central Bank, Erebuni Hotel, Government House, History Museum of Armenia, National Gallery, Vernissage). 40.171744.51335 Zoravar Andranik (General Andranik, formerly Hoktemberyan), Tigran Mets Ave (for Spartak (Armenia) Sports Stadium, Ayrarat Market, Luna Park, Saint Gregory Cathedral, Tashir Mall, agricultural bazaar & GUM market). 40.15517544.5072366 Sassountsi David (David of Sasun), Sevan St (for Yerevan Mall, Yerevan Railway Station). 40.140544.49817 Gortsaranain (Factory), Street Bagratuniats near to intersection of Arshakuniats Arshakuniats Ave (for Nairit Chemical Plant). 40.145344.48498 Shengavit (Chengavit), 9th St (for shuttle minibus to Charbakh). 40.15144.48359 Gareguin Njdehi (Garegin Nzhdeh Square, formerly Spandaryan Hraparak), Garegin Nzhdeh Square, (for Mika Stadium, Yerevan Lake). More than a hundred minibus (marshrutka, pronounced mar-shroot-kah) routes criss-cross the city and travel to the suburbs and beyond (such as to Georgia or Karabagh). At 100 dram a ride in Yerevan, they are a bargain. The minibuses are often overcrowded, and you may find yourself standing, crouched without a seat during rush hour. The route number is displayed prominently in the window, along with Armenian text listing the major landmarks and streets of the route. The Opera (ՕՊԵՐԱ) is an easy Armenian word to recognize on these signs, and is the main crossing point of many of the lines. When you want to get off, you should say “kangnek” or “ijnokh ka” for the driver to hear, or else, just say “stop” in English. The numbers of the minibuses are written on the bus stations though and the webpage of the tourist information has the whole list with destinations. Pay when leaving a minibus. Yerevan Routes is an app for your Android/iPhone. It does not give you exact bus schedule but still a very useful (and the only) way to find out about all bus, trolley, and marshrutka routes: Android version [dead link] & iPhone version. Abundant throughout the city, a taxi anywhere within the center should not cost more than 600 dram. Almost all taxis with company names on the sides have meters, and prices tend to be competitive among taxi companies. To flag an empty one down on the street, just hold your arm out and pat your hand in the air, if they’re free they’ll stop. Taxis without a logo on the side tend to charge more, and may to try to get more out of foreigners. To avoid being ripped off, either call a taxi from a big company or head for the most modern looking ones which usually have a meter. Make sure that the driver switches it on when you start and politely remind him to do so if he has "forgotten" it. If taxi has meter and the driver hasn't turned it on, in most cases passenger can not pay for the trip. Carry some coins to prevent the drivers from telling you that they have no change on them. Standard price is a minimum of 500 dram for the first 5 km and 100 dram for every further km. A car and driver can easily be rented for day trip outside of Yerevan, for as little as US$20 plus fuel. The local Uber is called gg (yes, lower case; you'll see the black-on-white stickers in the rear windows all over the city); it does require an Armenian or Georgian SIM card to register, but if you have it (or have a friend who has it), trips within the center are charged a flat rate of 600 dram. Beware of moonlighting "taxi" drivers at the airport who will try to charge you ridiculous amounts (20,000 dram or more) to get to the city. Finally never ever believe any taxi driver who wants to convince you that there is no bus or minivan to the destination you are heading to. Possible, but largely pointless - taxis being so cheap. If, however, you are renting for side trips to the countryside, but are based in the city, take note of the local driving habits. The residents are not aggressive (if you don't count black Mercedes SUVs with Russian plates - these are downright crazy), but not accommodating either. You'll be calmly cut off or overtaken; prepare for turns and lane changes in advance. Police are very thorough; they patrol the center constantly, with flashing lights but no sirens, and pounce when they see a violation (such as crossing a solid line). Traffic jams occur because everyone rushes onto the intersection on green, are then stuck there as the light turns, and then the crossing traffic repeats the same exercise. Parking in the center is mostly paid (except nights and weekends), but not particularly tight; there are clear instructions in English on the parking columns, but do yourself a favor and buy a weekly pass at the rental agency - at only 1,000 dram, it's a ridiculous bargain (your plate number is then entered into the database and the meter maids check against it). The curbside parking may be at a premium in some places and at certain times; nearby establishments then commandeer the portions of the road out front, and a semi-official-looking "assistant" in a reflective vest might be waving you into a spot if he sees you intending to park there. Accept the offer; the payment for the services is not expected until you depart, and then for the 100 dram coin he will venture out into the traffic and stop it, allowing you to safely back up and drive away. 40.18436944.5189781 Katoghike (Holy Mother of God Kathoghike Church, Սուրբ Աստվածածին Կաթողիկէ Եկեղեցի), corner of Sayat-Nova Ave. and Abovian St (Metro: Yeritasardakan 300 m). The oldest surviving church of Yerevan. It is a tiny structure constructed in typical Armenian style. Katoghike means "cathedral"; the reason for the incongruity is that the present-day church, dating from XIII century, was incorporated whole into the XVII century basilica - but that one was pulled down in 1936. In 2015, the Catholicos consecrated the large white-and-pink Surp Anna church that is now adjoining Katoghike. 40.21504844.5719652 Katoghike Tsiranavor Church of Avan (Ավանի Սուրբ Աստվածածին Կաթողիկե Եկեղեցի, Katoghike Tsiranavor church, later renamed Surp Hovhannes) (in Avan district). This is the city's oldest surviving church, which was completed in the 6th century. 40.17194444.5166673 St Gregory the Illuminator Cathedral, Yervand Kochar St (Metro: Zoravar Andranik). Completed in 2001 to commemorate the 1700th anniversary of Armenia as a Christian nation. The holy relics of St Gregory the Armenian were given back to the Armenian Church by the Vatican in 2001 and placed in this cathedral. The building is a megalomaniacal exaggeration of traditional Armenian Church Architecture. As opposed to all other churches in Yerevan (and Armenia) the cathedral is full of light and does not carry any stand for candles. The candle-house is a separate structure next door. However, the complex is vastly and visibly unfinished. 40.18139644.5651884 St Sargis Vicarial Church, Galshoyan St (at the border of the city centre, on a picturesque gorge of Hrazdan River, Metro: Yeritasardakan 2 km). From the Victory Bridge (or alternatively the Brandy Factory building) there is a beautiful view on the church and surroundings (structures of different shades constructed in immediate proximity to the church during the Soviet years of forced secularisation). The church is always crowded. Usually there are also many young people as St Sargis (or St Sergius in Western churches) is the patron saint of young people and of lovers. 40.1867544.541255 St Astvatsatsin of Nork (Holy Cross Church, Սուրբ Խաչ եկեղեցու), Nork-Marash (Նորք-Մարաշ) administrative district, near to Olimpos Educational Complex (The most convenient way for reaching the church is using Yerevan funicular. The funicular itself is a special experience. However the church is not immediately next to the funicular stop so you may need some help of the locals at the end. The entrance to funicular is at the crossroad of Nalbandian and Charents streets. The church is in the Nork district of Yerevan - the sleeping quarter of rich.). This is the replica of a beautiful 18th-century St Holy Mother of God (Sb Astvatsatsin in Armenian) church destroyed during the Soviet years of forced secularisation. Because of the sudden death of the benefactor the church complex was never finished. 40.18526544.5036736 St John The Baptist Church (St Hovhannes Church), Saint Hovhanes Street (Southwest 500 m from Metro Marshal Baghramyan, near main Post Office). 40.14064744.5379497 Erebuni Fortress, Erebuni St.(Էրեբունի փող), 38 (Metro: Sasuntsi David 2 km), ☎ +374 10 432661. The excavations, recreations and museum of the nearly 3,000-year-old fortress that established Yerevan. Fairly well- (and maybe the best-) preserved fortress of Urartian Period in Armenia. 40.17752544.5125728 Republic Square (Armenian: Հանրապետության Հրապարակ Russian: Площадь Республики) (Metro: Republic Square). The city's main square is a grand example of Soviet public architecture. The early buildings (the Houses of Government, the Ministry of Communications and the Marriott Hotel) are Neo-Classical with Armenian hints. The later buildings (the Foreign Ministry and Art Gallery) are Modernist imitations. 40.18222244.5147229 Northern Avenue (Metro: Hanrapetutyan Hraparak (Republic Square)). Impossible to miss, this pedestrian avenue was opened in 2008 connecting Opera with Republic Square, the two hubs of central Yerevan. It's a post-modern response to post-World War II Soviet Yerevan architecture. It is emerging as the shopping district, together with Sayat-Nova ave., Terian st., Tumanian st. and Abovian st.
40.185344.520710 Abovian street (Աբովյան Փողոց), Kentron district (Metro: Yeritasardakan). It's home to very few remaining Belle Époque period structures of Republican Armenia. Some gems of Art Nouveau, early Modern (constructivist and the like), and Moorish Revival style can be found in the backyards of Abovian, Nalbandian and Hanrapetutian streets. Most often they are in a very poor condition due to neglect. Hanrapetutian st. might get a special attention if you are not time constrained. 40.1853644.5152211 Freedom (or Theatrical) Square. North side of the square is the Opera House, followed by a park full of open air cafés on the eest, from south it borders the Northern Avenue, and on the east the square slowly transforms into park with Swan Lake. 40.182544.50972212 Mashtots avenue, Mashtots Ave (in the centre). It's the 8-lane highway of the city which somehow also accommodates a pedestrian zones on the sides (result of standard Soviet planning of main 'Prospekts'). It is overly noisy because of the heavy traffic (mostly unorganised public transportation) but the parts close to The Opera is a favourite hangout place for the locals. There are three buildings on the avenue which are well worth attention - Matenadaran, the covered market (the interior is now a modern supermarket and mall, but the highly-decorated original exterior survives) and Blue Mosque. 40.1920744.5211313 Matenadaran. Houses the world's largest collection of Armenian illuminated manuscripts, and one of the largest such collections of any kind in the world. A display room has a sampling of some of the finest works, and the additional cost of the guided tour is worthwhile. The building is dug into the hill and can withstand a nuclear attack. The white stone statue in front is of Mesrop Mashtots, teaching the Armenian alphabet, his invention, to a rapt disciple (Koryun, Armenia's first historian and biographer), and looking down at the street of his name. 40.178144.505614 Blue Mosque, 12 Mesrop Mashtots Ave ( : Hanrapetutyan Hraparak). An 18th-century Shia Islamic Mosque, one of the extreme few surviving structures of a once (before Soviet secularisation) prospering Muslim community of Yerevan. 40.19017544.51340616 Aram Khachaturyan House Museum, 3 Zarobyan St., ☎ +374 10 589418. 40.1787544.51416717 The National Art Gallery, Republic Square. Located in the same building as the History Museum of Armenia. Features several floors full of mostly paintings, organized by their country of origin. The Armenian collection is the best and of very high quality, the Russian is quite good (Kandinsky, Serov, Chagall), and art lovers will enjoy the European collection as well. 40.1797244.5053721 Contemporary Art Museum, Martiros Saryan St (North of the Blue Mosque). 40.17877344.50012423 Parajanov Museum, 15&16 Dzoragyugh 1st st., ☎ +374 10 538473. The House-Museum of Sergei Parajanov, a famous Soviet film director. The museum is best known for special Parajanov collages and art that everybody loves and enjoys. It is equally highly appreciated by children, teenage and most demanding art critic. Many highest level official informal meetings are conducted here. It is a must-see! Fee €2 and the guided tours €8. 40.18583344.49055625 Armenian Genocide Memorial (Genocide Museum & Tsitsernakaberd Monument) (Ցեղասպանության զոհերի հուշարձան), Tsitsernakaberd hill (on hill west of city centre). Monument always open, museum Tu-Su 11:00-16:00. An austere monument & museum commemorating the victims of the Armenian Genocide. The permanent collection documents the 19th C community, then its ruthless destruction circa 1915 at the hands of the Ottoman Empire. 40.17844.503226 Museum of Woodwork, Paronyan 2 (At a ring border of downtown). Houses some artifacts of Armenian historical wood carving culture (doors, furniture and the like), and wood-based sculptures by modern day artists. 40.1552544.509631 Fountain of Davit Monument, Tigran Mets Ave (Metro: Sasuntsi David). Built in 1948, around 460 m². 40.1816244.5168632 Fountain of Charles Aznavour, Charles Aznavour Square (Opp. to (Russian) Drama Theatre after Stanislavsky). 40.1880644.5192233 Water Pool of Park Yerıtasardakan. 40.173644.501634 The Ararat Cognac Factory (Ararat Wine Brandy Vodka Factory Museum), 9 Argishti St, 9 Admiral Isakov ave, ☎ +374 10 547048, fax: +374 10 547-047, e-mail: info@noy1877.am. The oldest factory in Armenia. Offers tours and tasting. 40.23050544.57041135 Levon's Amazing Underground World (Levon Arakelyan's Magical Cave), Village Arinj 5th St, 9 (8 km from Yerevan on the way to Garni). Levon Arakelyan's wife asked him to dig a potato storage cellar, but instead of this he created a complex structure of stairs, corridors and rooms inside a rock. It took him 23 years to do this until he died in 2007. His wife now organises excursions showing these undergrounds. 40.1952544.52481736 Mother Armenia (Մայր Հայաստան հուշարձան), Victory Park, Saralanj Ave (Metro: Yeritasardakan 600 m). Erected in 1967, replacing the monumental statue of Joseph Stalin. 40.190444.509237 National Assembly of Armenia, Baghramyan Ave. 24 (Metro: Marshal Baghramyan). Parliament building. 40.17462344.50435338 Yerevan City Hall, Argishti St., 1. 40.20492344.5588472 Water park "AquaWorld", 40 Myasnikyan Ave, ☎ +374 10 638998. 12:00 – 21:00, indoor water park "Aquatek" is open all year round without holidays. A water park popular with the locals in the summers, it consists of a big open-air water park and a much smaller indoor one. Anybody can cool down there as in total it offers 7 outdoor and 3 indoor pools. There are also wall-climbing facilities. During winter time, the largest pool of the park is turned into an ice skating rink. Watch football ie soccer. Yerevan is home to seven of the nine teams in the Premier League, the top tier of Armenian football, so there's sure to be a game in town during the winter season. The likeliest to be involved in European fixtures is FC Alashkert. They play at the 6850-capacity Alashkert Stadium, which they share with FC Ararat Yerevan; it's 3 km west of the centre off the road to the airport. 40.179544.49816 Children's Railway Park, Hrazdan Gorge (Close to Parajanov Museum). 40.176144.50687 Children's Park (շարժապահեստ Մանկական), Kentron (Metro: Zoravar Andranik 700 m). Yet another beautiful remnant of Soviet urban planning in Yerevan. The park, opened in 1937, is situated in a gorgeous canyon of Hrazdan river and features a children's railway. Though the park and the railway still function, most of the infrastructure is horribly deteriorated. On the other hand the deterioration gives the feeling of a 'ghost park from a fairy tale' even though it is always populated. To find it you will need directions from a local. 40.17416744.5080569 English park, Alek Manukyan St.
40.1615444.50197310 Park of Komitas Pantheon (Պանթեոն` Կոմիտասի), Arshakunyats Avenue (NW of Yerevan Train Station). 40.19138944.50611111 Lover's Park (Boghossian Gardens), Marshal Baghramyan Ave., ~21 (Metro: Marshal Baghramyan), ☎ +374 10 224437, e-mail: info@bg.am. The oldest park of Yerevan. Renovated in tradition of Japanese landscaping with Armenian spirit. It often hosts open air art exhibitions and concerts. It is best reached by metro, station 'Marshal Baghramian' - perhaps the most underused building and allegedly the best in Modernist style. 40.32055644.52694412 Lyon Park (Vardavar Park), Argishti, Sasuntsi Davit St (Vardavar Lake). 40.173444.518413 Oghakadzev park, Khanjyan str (SE 1 km from Metro Republic Square). 40.18544.514314 Opera park, Mesrop Mashtots Ave. Spend a late night at a café in the Opera park, and outside the Melody Café for some of the best people watching in Yerevan. 40.187244.514215 Saryan Park, France square (west side of Mashtots between Tumanyan and Sayat Nova). A triangular park with a statue of the painter Martiros Saryan is where painters gather to sell their work. Many more on the weekend than on weekdays. 40.184844.515416 The Swan Lake park, Teryan St and Tumanyan St (Metro: Yeritasardakan). ends with the controversial statue of the composer Arno Babajanyan, which already was majorly reshaped twice during the first year of its placement. The Swan Lake park usually hosts various open air art exhibitions. Ice-skate with many locals at the Swan Lake (next to the Opera House) during winter months. 40.192244.479717 Tumanyan park (Along the Hrazdan River gorge). Part of its the Tumo Centre for Creative Technologies. 40.160644.479918 Yerevan reservoir (Yerevanyan Lake), Admiral Isakov ave. (SW 2 km). Built in 1963, total area is 57.45 ha. 40.196144.519919 Victory Park. - Amusement park. Features a huge monument of Mother Armenia as well as some Soviet military equipment on display. Very nice view of the city centre. 40.185844.51520 The Opera House (the 'soft' centre of the city?). The building is perhaps modeled after SemperOper of Dresden, however it is supposed to be double as beautiful as the Yerevan building is two sided: One side (entrance from the Theatrical/Freedom square) is home to Opera and Ballet Theatre, while the street side houses the Khachaturian Concert Hall. For music fans, attend cheap and excellent performances at the Opera or the Chamber Music Orchestra. If a national dance group is performing, don’t miss it. 40.31508644.871221 Moscow theatre, Abovyan St.
40.1733344.5073222 Sundukyan State Academic Theatre (English Park). Vardavar is the pagan holiday of water (now a church holiday). It is a summertime movable feast that is mostly enjoyed by virtually everyone, grown and child alike: litres of water is poured on everyone by everyone. Some parks have administered events. Trndez is the pagan holiday of fire (a church holiday). It is observed on the February 13. Huge bonfire can be observed in each courtyard with people merrily singing around, youngsters jumping over and the like. Golden Apricot. A fairly well-established international film festival, usually held in July. Armenians take pride in it. ReAnimania. An emerging international animated film festival held in autumn. Most of the sights in Yerevan are concentrated in the centre, which is very walkable. Spending a few days visiting the major sights should be enough time, and try to get in a trip to Vernissage flea market on the weekend. Also there are number of day trips can be done from Yerevan. Diaspora Armenians may obtain a residency permit to live and work in Armenia without a problem. A 10-year visa/permit for US$350 is available, or for those with the right paperwork, citizenship can be had for free. Non-Armenians should have an invitation, or establish a business to get a work/business visa. Volunteering in Armenia may be a suitable for those wanting the experience. Armenian Volunteer Corps can organize a volunteer placement and visa for you. For those of ethnic Armenian descent, there are programs such as Birthright Armenia, which will pay for your trip if you participate in their program. Tutoring in English is always an option for native English speakers. Demand to learn, and practice, English conversation is high. Utopianlab- A coworking space in central Yerevan, convenient to meet local, mainly IT people. Impact Hub - A coworking space in central Yerevan. A number of organizations are also based out of this space. The Loft and Aeon are decent spaces to work out of during the day with wifi. They have wifi and pay by the hour, with free drinks and snacks. The people do tend to be younger though, especially in the evenings, and not everyone goes to work, so they aren't the perfect fit for everyone. 40.172244.5131 Ayrarat Market, 31 Tigran Mets Ave ( : Zoravar Andranik). Cheap items. 40.17611144.5178983 Vernissage (From : Republic Square a block east). Sa Su. A walk through the weekend Vernissage through the park is a must. From rugs, souvenirs, instruments and paintings, to pets and chemistry supplies, this outdoor market seemingly has everything. 40.1801344.487854 Dalma Garden Mall, 3 Tsitsernakaberd Hwy, ☎ +374 60 461111. 10:00-22:00. Western-style indoor mall with food court and movie theater. 40.15521344.5000565 Yerevan Mall, 34/3 Arshakunyats Blvd., ☎ +374-11 888 888. 10:00-22:00. Western-style indoor mall with food court, movie theater and play area. Anchored by Carrefour. 40.1710344.518846 General Market, 7/4 Yervand Kochar St (Near to Saint Gregory The Illuminator Cathedral), ☎ +374 10 550785. A supermarket. 40.1751144.520578 Subterrranean bookshops at Khanjyan St, Khanjyan St and Vardanants St.
Exchange kiosks at Zvartnots Airport have only a 3% spread between "buy" and "sell" for major currencies, so these are very good value, and downtown is similar. (Western high-street exchanges have about 15% spread, and airports 30% or worse.) However for less common currencies eg Turkish lira the spread is much wider: exchange only the minimum at the airport then shop around for better rates downtown. Stores and restaurants will frequently accept US dollars, euros or western credit cards. Cash in Armenian dram can be withdrawn from numerous ATMs in the city, but you may have to try several machines before getting money. You can also withdraw money from your card at a bank, but it may take visits to several before you find one that will let you do so. Design cafe, 42 Toumanyan st. (near Yerevan State Lingustic University), ☎ +374 10 531333, e-mail: info@designcafe.am. A place to eat and relax, signature interior, delicious food, perfect service, Internet cafe second hall, free high speed Wi-Fi. Lunch time discounts 15%. 40.1855544.513443 Melody Cafe, Freedom Square. Cheap restaurant, lots of food options and drinks. Very central, next to the Opera at the Freedom Sqare. Free Wi-Fi. 40.180994944.51587994 Abovyan 12, Abovyan 12 (!). cheap, with a shaded courtyard for outdoor dining. Entrance is via a gift shop, and easily missed. Outdoor cafe with a colour-changing fountain. 40.18298444.5165616 L’Orange hamov, 21 Tumanyan St. Has great service and a good menu. The Club, 40 Tumanyan St.. Has some excellent Western Armenian dishes, including manti, su borek and the amazing midia dolma. The underground space is very hip, and the tea room, when not too smoky is a good place to sit on a bean back and chat. For a budget option, you can order one of their very filling thin crust pizzas, starting at US$5..
Armenia is a place to drink, with no prohibition against drinking in public. Cafés, bars, restaurants, clubs and the countryside on a picnic are all popular places for vodka, the usual drink of choice, with wine, beer, champagne and brandy all popular as well. Most restaurants only sell pilsner-style beers, of middling quality, but some brew pubs and craft beer outlets can be found. Restaurant wine is usually very good. You can drink in a car, as long as you’re not driving. Drivers cannot have a drop of alcohol in them, with zero being the legal threshold – and the penalties for violating this are stiff. The most popular places to drink in the summer tend to be outdoor cafés and café/restaurants. The cafés by the Opera and Republic Square are always packed. 40.18515544.5093821 Calumet, 56a Pushkin St., ☎ +374 94 359229. Bohemian, friendly, alternative crowd. Insanely smokey. Seriously. free. 40.18749444.5100892 Red Bull Pub, 2 Saryan St. (corner of Saryan and Tumanyan. ), ☎ +374 10 580375. One of the oldest pubs in Yerevan, open since the 1990s. Friendly local crowd. 40.18447344.5142223 Wild West Pub, 25 Tumanyan st (entrance on Koghbatsi), ☎ +374 10 581664, e-mail: roaleks2007@yandex.ru. Good drinking hole by the Opera. Yerevan has a serious café culture, and it can be hard to tell where one outdoor café ends and the next begins as they run into each other. 40.17480844.5122714 Mirzoyan Library, 10 Mher Mkrtchyan (Petros Adamyan) (Hard to spot inside the courtyard at 10 Mkrtchyan/Adamyan). Started out as a space in a traditional courtyard with a collection of photography books, it's now a café with very nice drinks and creative and excellent bites and sweets. Free wifi. In Yerevan there are plenty of nightclubs, pubs, karaoke and strip clubs. Popular nightclubs are mainly in the centre, with longtime standbys such as Atlantic, Relax, Astral and Club One usually full on the weekends. Opera Club, 54, Tumanyan St (the basement of the Opera building), ☎ +374 10 541222. 13:00-18:00, 19:00-12:00. Men 1,000 dram. Kami Club, 18, Abovyan st (near Moscow cinema), ☎ +374 10 519020. Tochka Club, 1/1 Baghramyan Ave (Opera Area), ☎ +374 10 500441. From 21:00. Men 2,000 dram. 40.18772644.5110115 Stop Clup, Moscovyan street, 37 Moskovian Str., ☎ +374 10 560780. Yerevan has a wide variety of accommodations but for the most part they are overpriced. If you're staying for an extended period of time, rent an apartment. Check the AUA (American University of Armenia), local travel agents (Menua tours, Hyur Service) or real estate brokers for rental listings. There is a good selection of hostels and homestays in Yerevan to choose from for budget travellers. 40.18562744.5168561 [dead link] Anahit Stepanyan's B&B, 5 Sayat-Nova ave, apt.25 (Across the Opera house square. Brabion flower shop right underneath the house. ), ☎ +374 41 0568134, e-mail: stepanahit@yahoo.com. The oldest bed and breakfast in the heart of the city with a view on the Opera house and the Swan Lake. Breakfast is included, there is free wifi in the apartment. They speak English, Russian, Italian and Arabic. From 4,000 dram. Balcony Hostel, Hovsep Emin 3/1, Arabkir ( : Barekamutyun station (the last one) and from there walk down H.Hakobyan st till you get to a little hill. Up the hill and to the right, it's the small metal door on your left. ), ☎ +374 10 264449, e-mail: balcony.hostel@gmail.com. Check-out: 12:00, but flexible. A small, budget hostel. Offers free wifi, laundry, a kitchen and shared bathrooms that are cleaned daily. English speaking, friendly, coffee and tea are free. 9,000 dram for single room, 6,000 dram for shared room with locker, 6,500 dram for room with light breakfast, 7,000 dram for full breakfast. Between November and May rooms are 5,000 dram..
40.18471144.5102272 Envoy Hostel, 54 Pushkin Str. (entrance on Parpetsi), ☎ +374 10 530 369. Check-in: 14:00. Winner of 'Best Hostel in Armenia' Award by HW 2010&11&13. Is centrally located, large and comfortable with free internet/wifi access, breakfast and tea/coffee facilities. All the rooms and common areas are air conditioned and spotlessly clean. English speaking staff is efficient and knowledgeable about traveling in Armenia and the regions. They also have a hostel in Tbilisi and offer weekly tours from Yerevan to Tbilisi with sightseeing and BBQ-lunch included. 7,000 dram w/ breakfast. Grammy Hostel, 15 Aghayan st.. A hostel, with a travellers' desk, free internet access, breakfast just for extra 500 dram, laundry, TV, a relaxation room where you can chill out and escape from the Yerevan hustle and bustle of the city, and a little garden where you can soak up the sun and relax on a bench. 4,000-7,000 dram (flexible). GuestHouse, Mashtots 52. They are very kind and it is very clean. However, they are almost always full. Hostel Glide (Three minute-walk from :“Barekamutyun”). A private house located two metro stops out of the centre, but in a quiet and safe place. It's very close to bus stations, and it is possible to see Ararat mountain from the windows. Run by a very hospitable family. Prices for beds start from 4,500 dram. 40.1866344.5254333 Penthouse Hotel & Hostel, 5 Koryun Street, apt 33/2 (near Matenadaran, Medical University, Abovyan Street, the : station Eritasardakan). It is an elegant duplex, clean, comfortable, with the amazing view of Biblical Mount Ararat. From 5,000-5,800 dram, including Armenian/continental breakfast. [dead link] Theatre Hostel. A small and cozy hostel 5 minutes walking distance from the main square. It is very clean, has many free facilities, such as Wi-Fi internet access, bicycle parking zone, etc. The prices start from 4,500 dram with light breakfast included. Yerevan Hostel. In the centre, 3 minutes from the : Republic Square. Friendly, knowledgeable English speaking staff available 24 hours a day. Very clean hostel, showers with hot water available day and night. Wifi available also a computer available for guests. Traditional breakfast prepared upon request, so always fresh. Flexible check in/check out times. Bag storage. 5,500 dram. Hotel Latar, 58 Fifth Street (15 km northwest of centre). Way out on edge of city, you'll need a car. The massive circular pool is a sight to behold. Doubles 100 US$. Yerevan is generally safer than many western-European cities, and crime and street violence is almost non-existent. Nevertheless, as in the most cities of its size, in crowded places and transport beware of pickpockets. The traffic can be quite rough, so pay close attention when crossing the street, especially in non designated area. There are about 3,000 dram fine for jaywalking. Smoking may appear to be the national pastime, and indeed, Armenia has one of the highest rates of smoking in all of Europe. To avoid the smoke, stick to restaurants with outdoor seating, let your taxi driver know it is not okay to smoke (they're not supposed to). There are a number of good non-smoking options, many of which can be found on this map of non-smoking places in Yerevan. The government has announced that smoking will be banned in restaurants and cafes beginning in November 2018, though legislation still has not passed. 40.1846844.505691 Main Post Office, Saryan Street (central). 09:00-18:00. Internet: Stores offering internet access with PCs are called Internet Club in Armenia. One of them is "CyberStars" located at 18 Avetik Isahakyan Street. 40.202444.48852 Belarus, 12/14, Nikol Duman st., ☎ +374 10 275611, +374 10 22 02 69. Bulgaria, 16, Sofia str., ☎ +374 10 45 82 33. Canada, Amiryan 1, ☎ +374 91 401238. 40.19058644.5124763 China, Baghramyan 12, ☎ +374 10 560663, fax: +374 10-545761, e-mail: chiemb@arminco.com. 40.1740444.506585 France, Grigor Lusavorich 8, ☎ +374 10 591950. 40.179844.52816 Germany, Tscharenz 29 (East of the centre). 40.189244.50737 Greece, 6 Demirchian Str. 375002 (Close to National Assembly of Armenia), ☎ +374 10-530051, fax: +374 10-530049, e-mail: gremb.ere@mfa.gr. M-F 09:00-16:00. 40.174644.50738 Italy, Viale Italia 5, ☎ +374 10-542-335. M-F 09:30-17:00. 40.176444.516239 Poland, Hanrapetutyan 44a (Metro Station Republic Square), ☎ +374 91-426-885. Romania, Str. Barbusse, nr. 15, Cartierul Arabkir (Metro Station Barekamutyun), ☎ +374 10-275-332, e-mail: ambrom@netsys.am. 40.175544.503710 Russia, Grigor Lusavorich 13a, ☎ +374 10 567197. 40.1764544.5145411 Swiss, 2/1, Melik Adamyan str. (Metro Station Republic Square), ☎ +374 10 524088, +374 10 529860. 40.195944.492212 Turkmenistan, 52, Yerznkyan str. (Metro Station Barekamutyun), ☎ +374 10 221029, +374 10 221039. 40.1924144.5049313 United Kingdom, Baghramyan 34 (Metro Station Marshal Baghramyan), ☎ +374 10 264301, e-mail: enquiries.yerevan@fco.gov.uk. 40.1650344.4813314 United States, 1 American Ave (1 km southwest of Central Bus Station), ☎ +374 10 464700, e-mail: usinfo@usa.am. Garni, 15 km east of Yerevan, has a Hellenistic temple and religious / royal complex, perched atop a canyon. Geghard Monastery, 5 km further, is carved into the canyon side. Khosrov Forest State Reserve is in the mountains above Geghard. Several monasteries, caves, and Kakavaberd ancient hill fortress. Echmiadzin (now called Vagharshapat), 15 km west of Yerevan, is the Canterbury of Armenia, with a monastery and cathedral compound. 3 km east are the ruins of Zvartnots cathedral. Ashtarak 15 km northwest has St Hovhannes Karapet Cathedral perched over the Kasagh gorge. Artashat 20 km south has Khor Virap Monastery. Armash, 60 km south east, has fish lagoons that have become an important bird habitat. It's up against the closed borders with Turkey and Nakhchivan, so expect official suspicion, and carry photo ID. Around Mount Aragats are Amberd castle and Church. Noravank Monastery, Noravank Canyon and Areni Wine Country are 80 km south-east. To the north around Lake Sevan are Tsakhkadzor, Sevanavank and Hayravank Monasteries, Noratus Khachkar Cemetery, and Dilijan old town. Jermuk, Sisian and Tatev monastery are further down the road southeast. Artsakh or Nagorno-Karabakh is a de facto separate republic, not internationally recognised. The only way in and out is by road from Armenia. The obvious next destination is Tbilisi. On the way, try to see the canyon and monasteries around Alaverdi. This city travel guide to Yerevan is a usable article. It has information on how to get there and on restaurants and hotels. An adventurous person could use this article, but please feel free to improve it by editing the page. This travel guide page was last edited at 00:05, on 2 April 2019 by Wikivoyage user Pacezg. Based on work by Wikivoyage users Traveler100bot, Pigsonthewing, ShakespeareFan00, Grahamsands and Ceever, Wikivoyage anonymous users 114.198.4.17, 114.198.20.217, 100.0.90.104 and 77.181.234.248 and others.